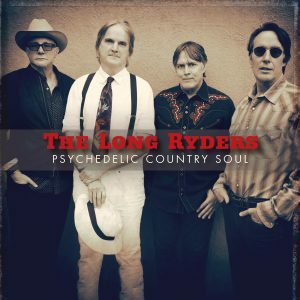 Alt Americana/Country heroes, The Long Ryders returned to the studio in 2018 to record their first album in 30 years. That same year, we had been reminded of what we were missing. The boxset remasters of State Of The Union and Two Fisted Tales together formed a reinvigorated benchmark against which any freshly minted recordings would be judged. After 3 decades it could’ve been a car crash, but the band proves itself to be surprisingly roadworthy still. It wasn’t like its members had been sitting with their feet up. Sid Griffin led the Coal Porters band for many years, Stephen McCarthy joined the Jayhawks (and several others) for a while, and Greg Sowders played several stints with the Misbegotten Cowboys, among others. Clearly, that skilful facility with psychedelia, soul and country, echoing Buffalo Springfield and the Flying Burrito Brothers, 20 years before those landmark albums, remains. But they’ve shed the punk undertones and added a sound more identifiably rooted in rock tradition. As was often the case with the band, what is initially underwhelming soon becomes sublimely exhilarating … and you can still hear that personal connection with the sixties on ‘Greenville’ and ‘Molly Somebody’, where the Byrds and the Beatles loom large in our consiousness, negotiating a deal between an economic 12 string jangle and smart, untheatrical pop optimism. The emotionally affecting ballad, ‘Let It Fly’, is as gorgeously understated a study of forlorn romance as you’re likely to encounter on any album, and ‘What The Eagle Sees’, a streamlined, cranked up slice of Cheap Trickish poprock, show us that the band have lost none of their power or flair for penning an affecting melody. Apparently, after all these years in the music business, maturity also brings with it an unavoidable cinicism. ‘All Aboard’ and ‘If You Want To See Me Cry’ mix dark wit, hope and despair into irresistible cocktails of contemporary country rock. Elsewhere, sweet harmonies and tight guitar interplay stitch each song to the next in the creation of one colourful quilt of back porch country, poetic pop and late night verdicts on the human condition. A cover of Tom Petty’s ‘Walls’ tells you where their heart is. As fresh testament from one of rock’s great survivors, Psychedelic Country Soul makes for a fascinating and rewarding listen.